Monday thru Friday: 8 a.m. - 5 p.m. 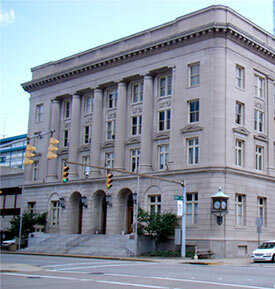 The Charleston City Collector's Office strives to provide prompt, accurate and courteous service to customers; to educate the public on tax, fee and licensing issues; and to utilize effective and efficient methods in pursuing and collecting all taxes and fees due the City of Charleston. The office is located in the new City Service Center located at the corner of Dickinson and Quarrier Streets in the bottom floor of the Municipal Parking Building. The Collector's Office is responsible for the administration and collection of City taxes and revenues of approximately $80 million. The City's major source of revenue is generated from Business & Occupation Taxes. Other sources of revenue include the City Service Fee, Public Utility Excise Taxes, Hotel/Motel Occupancy Taxes and Municipal Fire Protection and Refuse Collection Fees. The Collector's Office is also responsible for registering and licensing all businesses located in or conducting business activities in the City. In addition, the Collector's Office oversees the registering and licensing of residential rental units located in the City. Effective July 1, 2010, any owner who leases or rents a residential rental unit located within the City is required to register their unit(s). The easiest and most convenient method to register your unit(s) is on-line via the City's website. This method allows you to register your unit(s) anytime from the convenience of your home or business. To access the on-line rental registration system, select the Business category at the top of the page, and select "Rental Registration". Owners may also register their unit(s) by calling the Collector?s Office at (304) 348-8024. If you need additional information, or if you have any questions on City taxes, fees, business licensing or residential rental unit licensing, please click on the desired link under the 'Documents and Forms' section located on the right hand side of this page, or contact our office at the telephone number or address above.